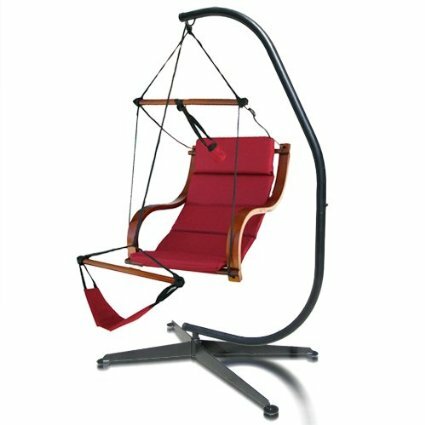 I was looking at Hayneedle.com today and ran across an interesting looking hanging chair. 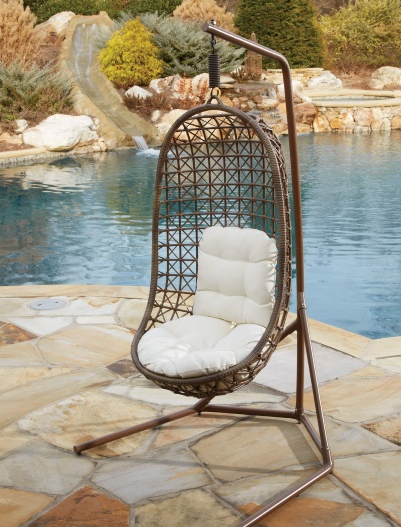 It’s official, albeit somewhat long winded title is the Panama Jack Island Cove open weave hanging chair with base. Yes, it is a mouthful, but it is also a damn cool looking chair. In all honesty, I never knew such contraptions existed. Looking at the picture makes me wish I also owned the house where they took the picture. The chair is made from weaved wicker designed to withstand all weather conditions. Viro wicker does not crack in the outdoor elements. Wide footing provides exceptions stability. Aluminum frame will withstand years of outdoor weathering. Ample space is provided by the chair with a width of twenty four inches and a depth of twenty nine inches. Attractive espresso finish for the most discerning tastes. Gently glides back and forth for ultimate relaxation. The manufacturer is committed to sustainable, renewable production. Up to this point everything sounds great. The main catch is the cost. This chair appears to be MAPP priced. Said another way, everyone appears to be charging the same $780 for this chair. I am not a huge fan of MAPP pricing because it seems opposed to the capitalist system by my way of thinking. If you don’t believe my MAPP claim, you can compare the price on Walmart. Panama Jack has made luxurious fine furnishings since 1974. Emphasis is placed on having a corporate conscious. Giving and sustainability are two principle components of their over arching ethic. Their furniture tends to look like it belongs next to a beach or pool in the Caribbean. This connection isn’t by mistake as this furniture is intended to transport you to a state of relaxation and bliss. Inevitably, some of you are saying, “that looks like a damn cool chair, but I don’t have that much money.” I understand this sentiment completely. Times have been tough recently and even when they weren’t, almost $800 was still a lot of money to drop on a swinging chair. The cheapest alternatives are to buy a C hanging stand for between $100 – $330 and the hanging chair separately. Hayneedle is based in Omaha, Nebraska. They were founded in 2002, using a microsite strategy. Hundreds of microsites were combined into the Hayneedle brand during 2009. In recent years, the company has experienced strong growth. They now have over 400 employees.